The train derailed near 41st street and the Dan Ryan Expressway in the Fuller Park neighborhood. Riders of Metra's South West Line should expect delays on the afternoon commute after a freight train derailed Thursday morning. The train derailed near 41st street and the Dan Ryan Expressway in the Fuller Park neighborhood. 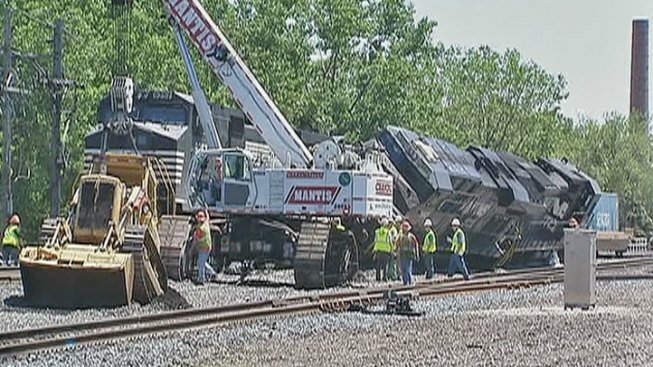 A spokesman said the train did not tip its side but its wheels were off the track and the train was leaning. Metra officials said to expect delays of up to one hour along South West Line routes leaving from Union Station. Metra posted a message to its web site. Due to the derailment of a freight train in the vicinity of 41st St. earlier today, SWS trains will be rerouted around the affected area during the evening rush hour. Outbound trains through No. 831, the 6:15 p.m. departure from Union Station, are expected to leave on time but encounter delays of at least one hour en route. However, outbound train No. 827, scheduled to depart Union Station at 5:18 p.m. and arrive 179th St./Orland Park at 6:27 p.m., has been annulled. Passengers are encouraged to take No. 825, the 5 p.m. departure, or No. 829, the 5:40 p.m. departure. Riders may want to consider taking the Rock Island Line or Heritage Corridor Line as an alternative. Inbound SWS trains are expected to depart up to an hour late. Trains scheduled for later tonight also are expected to encounter significant delays. Detailed information will be posted as soon as it is available.